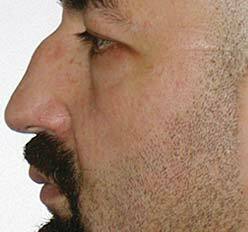 Rhinoplasty is an operation designed to reshape and re-proportion the nose. Often rhinoplasty alone is not enough to enhance the profile and chin augmentation is recommended to correct a receding chin. Showing your surgeon photos of noses you like or dislike is helpful in achieving the look you are striving for. However, the end result depends on a variety of physiological traits such as skin texture, anatomy and healing of scar tissue. Rhinoplasty is outpatient surgery performed in a hospital surgical center and is frequently performed entirely through the nostrils. There are no skin incisions unless nostril narrowing is done. The skin is lifted off the framework of the nose. The bones and cartilage comprising this framework are then repositioned and remolded to create the desired result. Some sutures are placed inside the nose which dissolve by themselves. 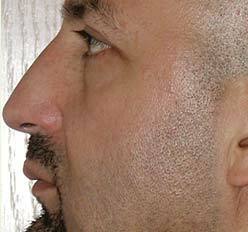 Occasionally, noses need to be increased in size requiring grafts taken from the ear or inside the nose. Certain artificial materials are also available. The use of implants is always discussed in detail with the patient before surgery is performed. A piece of cartilage in the middle of the nose that separates it into two chambers is called the nasal septum. A deviated septum occurs when the nasal septum is dislodged or bent. This can cause obstruction of breathing and correction of this problem at the time of nasal surgery may alleviate the situation. There are also structures in the nose called turbinates. The turbinates are part of the nose’s air-conditioning system, and they naturally swell and contract as part of the normal nasal cycle. In some people, these are chronically large and can be decreased, enlarging the breathing passages and improving breathing.